The 11m Offshore Raiding Craft (ORC) is a development of the 9m ORC which is in-service with the UK Royal Marines. This 11m Mid Console Variant in its basic form of a base vessel can be configured to fulfill two different roles, either as a Troop Carrying Variant (TCV) or as a Fire Support Platform (FSP). In either configuration the craft is provided with a forward weapon pedestal capable of mounting either a twin GPMG or a single HMG. 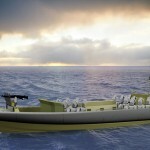 In the TCV configuration the craft is fitted with susspension seating for 12 Troops and two crew. The bulwarks can be fitted with ballistic armour panels providing protection from deck level to the top of the bulwarks. The components to configure the base vessel into a TCV can be fitted in less than two hours. 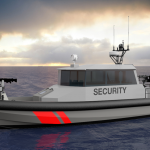 In the FSP configuration the craft is fitted with a ballistic armour panel framework which raises the protection to approximately 1100mm above deck level. Also incorporated into the framework are three weapon pedestals one port, one starboard and one aft on the centreline. Additional seating modules are also fitted to provide seating for two gunners forward and three gunners aft. The components to configure the base vessel into a FSP can be fitted in under four hours.